Sometimes our expectations don’t live up to reality of a situation. This is why I try to keep my standards high, but my expectations low. This is a strategy shared with me by a friend. In her case, she’s referring to dating in her forties, but it applies in most life situations—essentially, don’t ever accept being treated as “less than”, but also readily expect to be disappointed. Sometimes reality bites. I forgot this lesson recently and it wasn’t pretty. But you know who IS pretty? This girl. 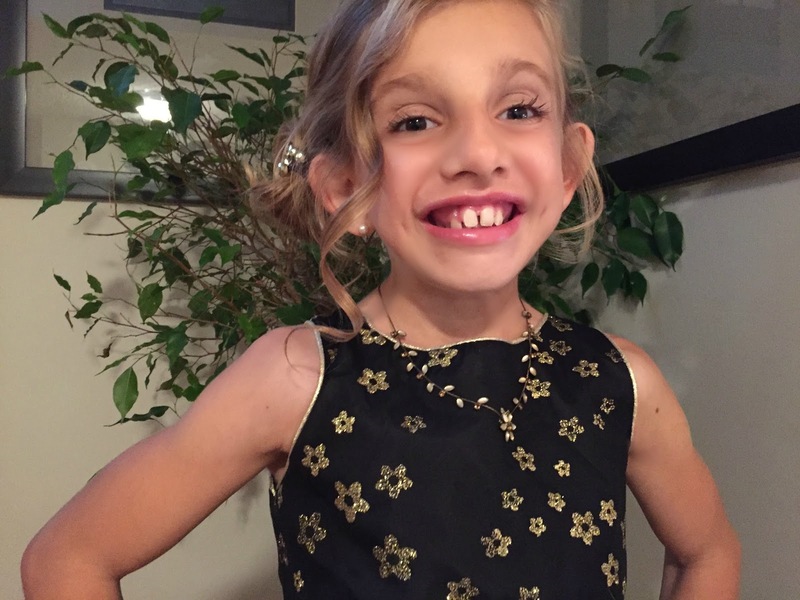 A friend generously offered Avery a pair of tickets to a Father/Daughter Charity Ball. Her family couldn’t use the tickets and the mom, who is kind to the core, knew how much our girl would love the spectacle of it all. The evening is sparkly and pink and musical and magical. Plus, dancing with daddy. All the things she loves. As the ball approached, we shopped for a dress and shoes. Avery spun around in the store and used the twirl test to choose a pretty black dress with golden flowers. 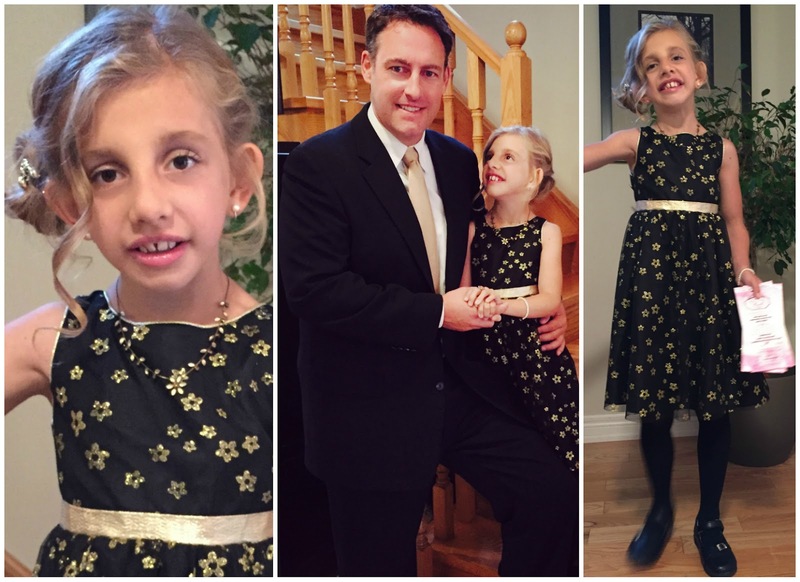 We did her hair and make-up, she wore jewelry and fancy shoes, and her dad matched his tie to his little girl’s dress. I cried no less than seven times before they left the house. I was anxious to hear what was happening. Were they having fun? A few hours later I heard the garage door go up. I jumped up, eager to greet my belles of the ball. I expected happy faces, tired maybe, but not distraught. Avery was crying so hard she was hiccuping. My husband looked utterly shattered. “What’s wrong? !” I asked in a panic. Had Avery choked? Did she have a seizure? It took a few minutes to get the full story, but it seemed we had a clear case of expectations not meeting the reality. Please understand, nothing particularly horrible happened. Avery simply tried to connect with a few girls at the ball, but they were excited and busy and tiared. They weren’t interested in befriending the girl who stammered and chased after them. As I watched a video clip of Avery by herself on the dance floor, happily spinning and clapping, I smiled. She was okay. She was having fun. But then she approached a girl dancing near her, holding a balloon. The music was loud and I couldn’t make out what Avery was saying, but I could see the girl mouth, “What do you WANT?” She then turned on her heel, leaving Avery standing alone. My jaw clenched and I got that annoying lump in my throat that I get right when I’m struggling not to cry. The video ended there. Her dad stepped in to dance with his girl. “Where are all my friends?” she asked him. She didn’t feel excluded‑just confused and eager to find somebody to play with. What upset her really was the silent auction. She and her dad put in a bid for a large pink stuffed bunny. When another girl won it, an over-tired Avery burst into tears. My husband—my soft-hearted will do anything for his family partner—found it all rather devastating. Not losing the bunny. In fact, he was happy not to have to lug that thing home. He was simply crushed by the reality of exclusion. Like I said, I should have prepared him better. The other kids weren’t being cruel. They were just being kids, at a ball, having a ball. They don’t know Avery. If she had gone with a friend, things would’ve been different. So her first ball wasn’t what we had imagined. But when you ask her about it now, she says it was “bootiful” and that she’d love go again. Some realities do bite. Winona Ryder was right about that. However, it also depends on how you look at it. Avery was invited to a ball. She got to shop with mummy for a sparkly dress and wear make-up and clip-on earrings and have her hair curled. She got to enjoy an adult meal under twinkling lights. And she danced with a daddy she loves her with all her heart. So the evening didn’t exactly go as planned, but the reality is, she is beautiful and happy and healthy and loved. That’s a pretty great reality. As for her dad? He said he was glad they went. He said it’s important for both parents to “live it.” And that next time, he’ll know what to expect and how to handle it. And, perhaps to avoid the Silent Auction.